I’ve been invited to join the 2018 Online Quilters Meet & Greet hosted by Benita Skinner's Creative Space. 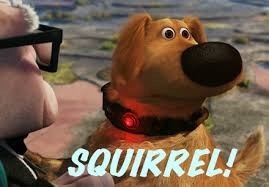 This post is to tell people a little about myself. My name is Wendy, I live in Maine and I work in the marine industry. I have a wonderful, loving family who understands and accepts (and often benefits from) my passion for quilting. I am a very traditional quilter, but I love seeing all types of quilting and textile art. I prefer hand work to machine and quilt almost every day. My favorite technique of late is the historic "potholder" method, whereby each block is individually quilted and bound and then stitched together to form the quilt. I like to inspire others to give it a try. 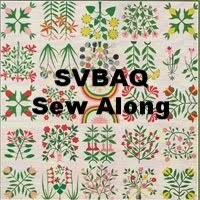 Although I have been quilting for over 50 years, I am fairly new to blogging. I lurked around the internet for years reading other people’s blogs until finally (in 2014) my friend Cyndi (BusyThimble) convinced me to give it a try. Quilting is a major part of my life. Sharing bits and pieces of my quilting journey with others helps to keep me moving forward. I truly enjoy the time I spend reading and conversing with my fellow bloggers. They help to keep my creative juices flowing! Wendy it is good to meet you. Hand quilting is an art and you do it beautifully. I love your leaf quilt. Nice to see you among the M&G group, Wendy. I've gotten to know you somewhat through Grace's posts and other. I was at the Pine Tree show at the end of July (gee, I almost wrote "last month," but it's September already) and saw some of your work on exhibit. Nice to meet you Wendy! I love reading blogs too, so many inspiring quilters, so much love in this community! Your leaf quilt is stunning! I for one am SO glad you started blogging! Nice to meet you on the Quilter's Meet and Greet! Beautiful quilts!! So nice to meet you, Wendy. Like you, I so enjoy reading and being inspired by so many amazing quilters. I LOVE your leaves. Nice to meet another Wendy! 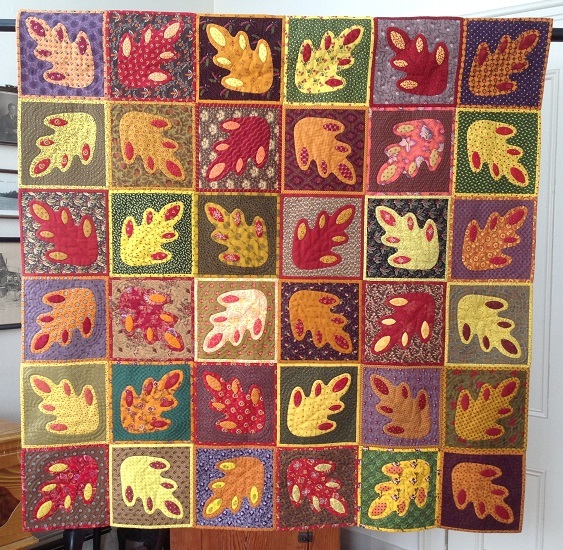 Your leaf quilt is very pretty, just in time for our fall weather. Thanks for sharing! I admire someone who does whole quilts by hand. I do love hand sewing/stitching/embroidery but quilts generally are machine stitched and quilted. It was nice getting to know you, Wendy. Wow, those leaves are just gorgeous. So glad your family supports this quilting addiction so many of us have! Blogging is amazing fun and you meet all sorts of great people. 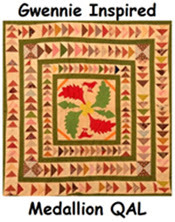 Your leaf quilt is perfect for this time of year. Thank you for inviting us over for a visit. Your leaf quilt is so lovely!! Lovely leaves, and a pot holder method, I must find out how that would go. Nice to meet you Wendy. I've never heard of the potholder method. Sounds interesting. Thanks for sharing. Thank you for sharing! Your Leaves quilt is Beautiful! !